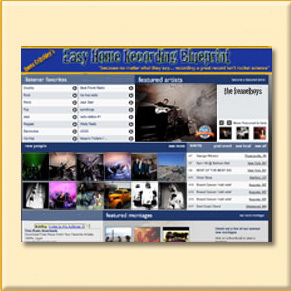 "Easier, Faster & Cheaper Than You Ever Thought Possible"
TODAY, with your Easy Home Recording Blueprint, you will also receive 4 things that can actually change everything for you and your music. 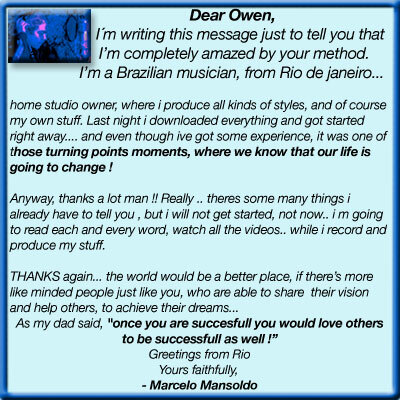 Q: "What is Easy Home Recording Blueprint and what is the Blueprint to Getting Heard?" A: Together they can change your recording future. FREE video presentation showing how The Easy Home Recording Blueprint method fools the best ears in the music business every day. "Is there a easy, clear, step by step method to record studio quality songs at home, without complicated studio equipment?" AND keep watching for a very special opportunity for you and your music to be heard by thousands of new fans every month. 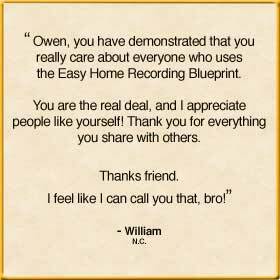 Look at the Success Stories and pro quality home recordings that are already coming in from new Easy Home Recording Blueprint owners. 1. Blueprint Users Around the World Collaborate with Owen Critchley to Record New Song That Gets Mastered by the Black Eyed Peas Mastering Team and Then Gets Released Worldwide. 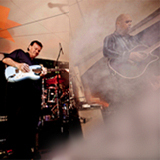 Get Heard By Thousands on the Featured Artists Page. SUBJECT: Copy Me and Use the Same Secrets That These New Blueprint Owners Are Using to Produce Music For Movies, TV, and Worldwide Release. 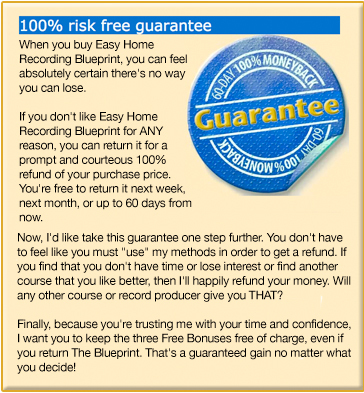 I welcome you to try my award winning Easy Home Recording Blueprint. I guarantee that right now there are new Home Recording Blueprint owners who are transforming the quality of their home recordings literally overnight. Easier, faster and cheaper than they ever thought possible. You should too." What Do Some of the Best Ears in the Business Have to Say? Owen, you recorded two versions of this song, I understand that. One you recorded at the studio we sent you to, and one you recorded at home? And you're telling me that I just picked the one you did at home? Holy $*@&! How the heck you manage that?!" "Owen, the tunes sound great. Sounds like someone really knows what they are doing. Mind me asking what studio you recorded them in?" "Only the highest quality songs make it to the top. This honor demonstrates the talent and dedication it takes to write a 'Hit Song'"
'stand up and stand out?" Right now you have the chance to make pro-quality recordings using just your own home computer and any recording software you like. In fact, my records are made using free recording software! Sounds nuts doesn't it? But it is 100% true. I just recorded a song for a U.S. tv series and another for a major compilation project featuring a bunch of major label artists. Those artists spent a ton recording their tunes. Not me... I recorded right here at home using myhome computer, 2 mics, just 3 cables and the Easy Home Recording Blueprint methods. Another song was just signed by Midfinger Records for release across Europe and it was recorded with, you guessed it, free recording software. A ballad has been recorded by 2 separate major label artists. 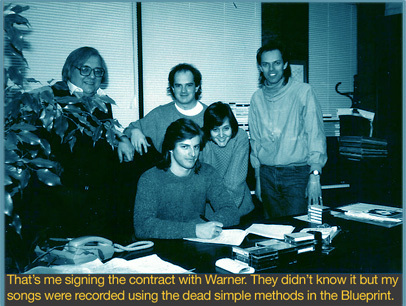 Where was the song recorded, that sealed the deals with these artists?... At home. Using the exact methods I have put together for you in the Easy Home Recording Blueprint. How about a Billboard Music Award? Yes! For a song recorded using the Easy Home Recording Blueprint method, just a few months ago. There's a song called "Come to London" that was recorded using the Easy Home Recording Blueprint, and it got featured at the biggest music conference on Earth. (The MIDEM conference in Cannes, France.) And then? It was picked up and 20,000 copies were released across Europe by a large record label there. I wanted to give the Blueprint method a real-world test for you. Here's what I did...I recorded 5 new songs, NOT in a professional studio, but instead, in my astonishingly stripped down studio at HOME, using the very simple methods laid out step by step in the Home Recording Blueprint. I knew my new methods would be literally a fraction of the work and price. BUT, I wanted to really test The Blueprint so I let the industry folks believe that I recorded the 5 new songs in a professional studio. In other words... I didn't tell any of them that I recorded these songs at home. Would these pros notice? What would they say? Well, when I played the new songs, NOT ONE of the industry guys could tell I had changed my studio or the way I was recording. The Secret is... You've probably heard me say this before but I'll say it again: "Recording clear, room-filling sound is NOT rocket science." There are certain simple details, when recording, that must be taken care of. I guarantee you that 99% of people recording at home are totally unaware of the little things that make a great sounding recording. The Easy Home Recording Blueprint makes sure that every step of the way, every single one of these very simple, but very important details are covered. Believe it or not, simply taking care of certain little details, in the right sequence, will instantly put you miles ahead of the 99% of aspiring recording artists, who let simple detail after simple detail slide. 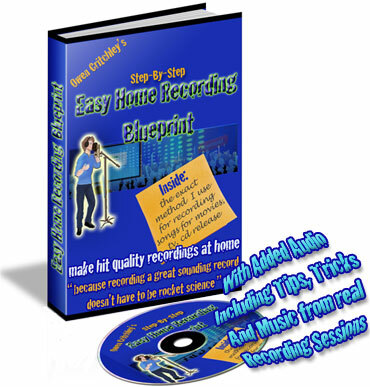 Easy Home Recording Blueprint's step by step, "copy me as you record" method, takes you through every one of the little things as they come along. Each step we take together will take you, and your music, a step closer to stunning sounding home recordings. I Think There's Something You Should SeeYou can probably tell that I'm passionate about this... that I believe in the Easy Home Recording Blueprint Method and what it can do for you and your music right now. But I created the Blueprint, so of course I would feel this way. No surprise there right? what using the Easy Home Recording Blueprint Method can really mean for your music and your immediate recording future. These people are Easy Home Recording Blueprint users and they have asked me to forward a message to you. Are you ready? Because it will happen FAST. Even after only your first couple of tracks are recorded, right before your eyes (and ears) your recording will sound like it was produced in a professional studio. "My advice is to be ready for people's jaws to drop when you play your first recording after using the Easy Home Recording Blueprint." The Standard Edition includes the full Blueprint method without embedded audio. 2. 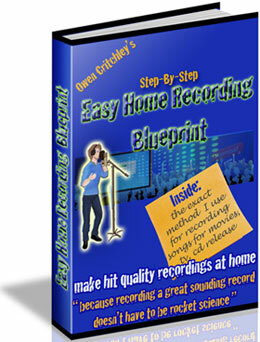 Easy Home Recording Blueprint - Premium Edition:Read along and listen too! Audio tips and tricks with my step-by-step commentary and music from real recording sessions in my studio. * Building a monster drum track in less than a minute. 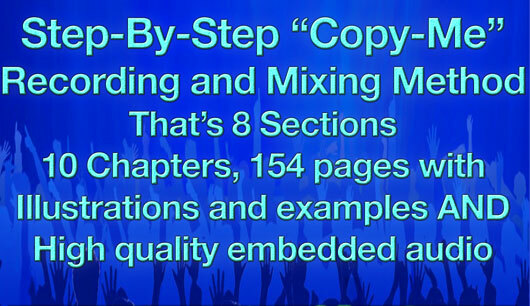 * You'll hear how to make spacious 3 dimensional mixes as I take you through the mix of a Billboard Song award winning song recorded using the "Easy Recording Blueprint method." 3. 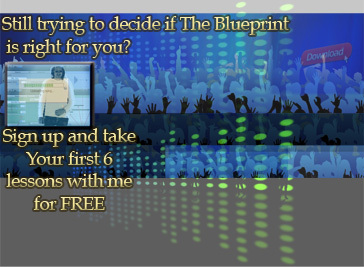 Free 6 part mini-courseIf you like, you can take your first step to becoming a "Blueprint Artist" by signing up for my mini-course and get a sneak peek at the simple Blueprint method. 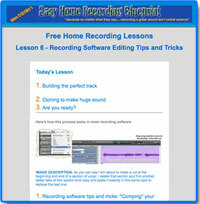 "Easy Home Recording Blueprint is a complete copy-me-as-you-go learning method." 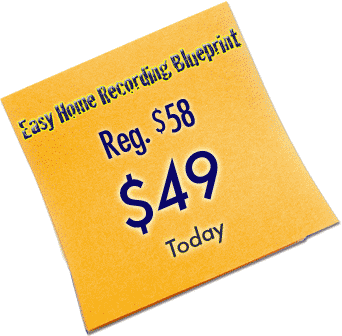 The Easy Home Recording Blueprint was designed to get you recording pro-quality recordings right away. This is possible because you will be copying me step by step. * Even total beginners will achieve high quality recordings...while they learn. 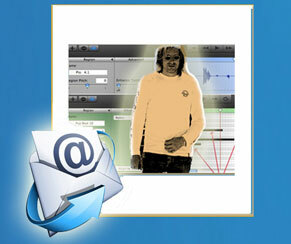 * The Blueprint becomes your recording companion as you keep it open as you lay down your tracks. * You'll be confident and excited to start, because you'll know that this is the exact method I use to record songs and music for movies, tv, cd release and licensing. 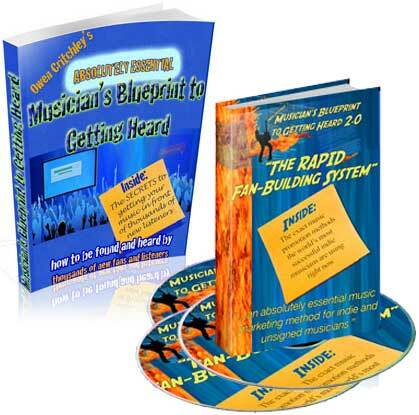 BOOK 2: The RAPID Fan-Building MethodOnce Blueprint artists start making their great sounding recordings at home, they are going to want the world to hear them. My 'Musician's Blueprint to Getting Heard By Thousands' will show you exactly how to be found and heard by thousands of new fans and listeners. Follow the steps and I'll show you exactly how to create your online presence that will be MILES ahead of virtually every indie artist on the web. "With the 'Blueprint to Getting Heard' you WILL be found and heard... not by one or two people, but by hundreds of new listeners every day." *I prove the results right before your eyes by showing you real world test promotions using the simple steps in the Blueprint to Getting Heard by Thousands. * 'Blueprint to Getting Heard,' combined with the great sounding recordings you'll be doing with the 'Easy Home Recording Blueprint,' has the potential to be a game changer for your music career. * "Getting Heard" is so popular that it is actually being sold separately here. * BUT, right after you pick up your copy of 'Easy Home Recording Blueprint,' YOU will get the 'Blueprint to Getting Heard,' FREE. You will find out how to lead thousands of new listeners and new fans to you and your songs. "The Featured Blueprint Artists Page"
* You and your recordings will get MASSIVE exposure to listeners from all over the planet. 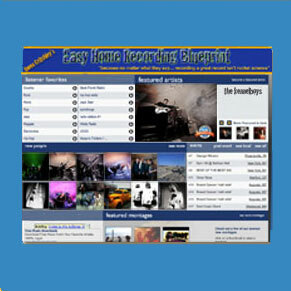 * Including links back to your own site or artist pages, driving even more new fans toward your music. As soon as you get your copy of Easy Home Recording Blueprint I'll give you a special email address, just for Blueprint artists, where you can contact me. I'll always be here, just an email away for any questions, tips or advice... or even if you just want another set of ears to listen to your recording. You see, I am about to release a Deluxe Edition of Easy Home Recording Blueprint that will include "copy me as you record" videos. But Today, included with your Easy Home Recording Blueprint, you will get lifetime access to this unique video series that will guide you straight to your own hit-quality home recording. You have this opportunity today to be present, every step of the way, as a song is recorded for worldwide release. You can literally copy every step I make as I record a new song that has been commissioned for a film release. "I've never seen anyone provide anything like this to home recording artists." I'm happy to invite you to have free access today to these unique 'copy-me-as-you-record' videos with your Easy Home Recording Blueprint. * almost NO extra equipment. Getting pro-quality sound at home easier, faster and cheaper than you ever thought was possible. Quickly consider what it would really cost you to learn all you need to know about getting pro-quality recordings at home, as well as tips, tricks and advice from a professional producer and recording artist... let alone learning how to gain exposure and be found and heard by thousands of new listeners. Picture yourself a month, or even a year from now. Do you see a future with a CD or computer full of great sounding songs and recordngs? That's great... what were your plans in achieving this before you came here today? * Have you been saving for recording software everyone says you need? * Have you already been recording, but it just doesn't sound professional? * Have you been assuming that you need expensive equipment, or even rent some time in a professional studio, to get the sound you want? ** Add all that stuff up and see how much this future that you've imagined really costs. Imagine that same future, full of great sounding recordings, except this time, imagine that you have achieved all this, and much more, using the Easy Home Recording Blueprint. That's $49 for EVERYTHING described above... including embedded audio of the Blueprint Premium Edition! That means the Blueprint Standard Edition (no audio) is just $43 today. All available by instant download, and designed to give you a massive shortcut to making your great records at home and making that future you pictured closer than you ever imagined. Regardless if you're a beginner or you just want recording pro-quality tracks at home to be simpler, cheaper and more fun. Please realize that this is a Special Offer.You've arrived here today in time to take advantage of this special price for Home Recording Blueprint Premium and Standard Editions. What will happen if you don't grab The Home Recording Blueprint today? Well... nothing much will change. And the quality of your recording, and your dreams of recording pro-quality tracks at home, will remain as they were yesterday, 2 days ago and last month. BUT, by placing your risk free order today, you'll get EVERYTHING you need to learn how to record monster, room-filling pro-quality tracks FAST, EASILY and using free or really cheap recording software and almost NO extra equipment. You will be able to match the recording quality of virtually any song you hear by established recording artists. And of course... blow away your friends AND yourself. 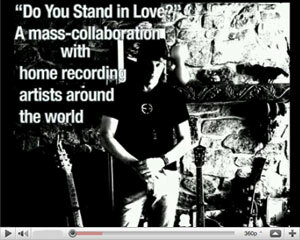 Will you take the next step and start recording your great sounding record? 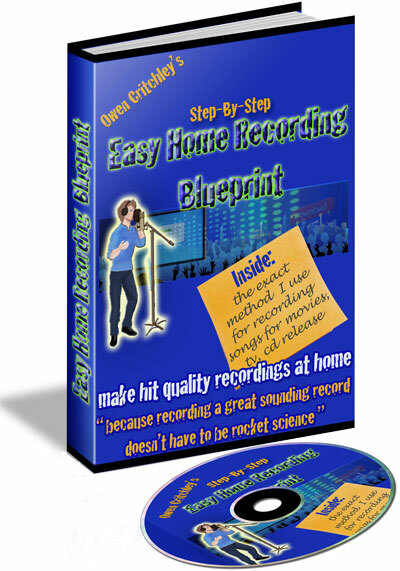 The step-by-step Easy Home Recording Blueprint will teach you everything you need to know to learn how to record pro-quality records, so simply, so quickly, that you will literally be starting right away. And you'll have the confidence of knowing the method works, because it is the EXACT method I use to record songs for movies, TV, CD release, compilations and licensing. The Home Recording Blueprint is available via instant download. When you click the order button below you'll be sent to a secure payment page at ClickBank. "The Blueprint method is the most powerful learning system for recording pro quality sound at home... simply, and so affordably that the next big hit may well come from someone's home computer"
Goods and services provided by RecordingHomeStudio.com. Sold by ClickBank Inc., Boise, ID USA. That's it from me! Here's to your great home recording future. PS - Remember, I guarantee that you will get great results, otherwise you can return it next week, next month, or even up to 8 weeks from now for a prompt, courteous, 100% refund. PPPS - A very popular question I get from Blueprint students is, "Will The Blueprint method and all its bonuses work for any style of music and recording?" This is a good question and the answer is... Absolutely! I write and record all styles of music and I rely on the Blueprint method for EVERY style and genre. The Easy Home Recording Blueprint method isn't about what kind of sound or style you want to record. It's about showing you how to easily and cheaply capture and create the sound YOU want. The techniques are designed to let you focus on your music and pursue your creativity and imagination wherever they take you. And remember... I'll always be close by via the special email address that you will receive with your copy of The Blueprint. You have no reason not to order your copy of the Easy Home Recording Blueprint right away! 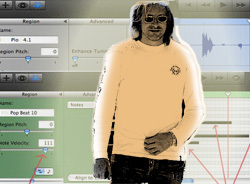 The following is an exerpt from "Q & A with Owen Critchley" Q:"Professional quality sound using free recording software? How is that even possible? Don't I need complicated recording software?" Owen: "No way. That's one of the most astonishing things about the Home Recording Blueprint. 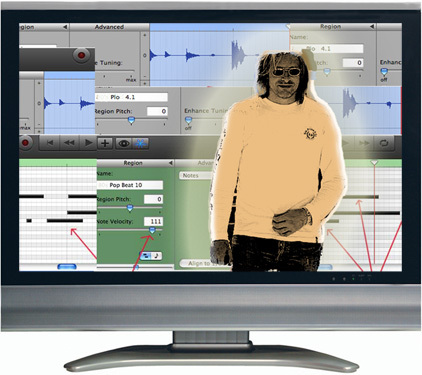 This method works with ANY recording software. Dead simple recording software is possible because The Blueprint focuses on showing you how to "capture" sound so beautifully and effectively, that we simply don't need complicated recording software and tons of toys to get clear, room-filling pro sound. You see, The Easy Home Recording Blueprint focuses on a specific combination of steps that makes each sound you record healthy and huge. Following this easy step by step method, maintains pro-quality sound from the beginning of your session to your completed mix. 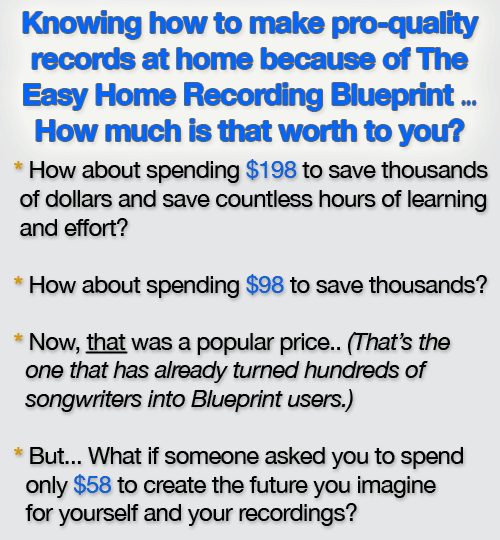 I think, for me, the most rewarding part of writing The Easy Home Recording Blueprint is being able to share this with people and then hearing from them about how The Blueprint is enabling them to finally get pro-quailty tracks at home. And they are so relieved and... surprised! that recording is exciting and enjoyable like it should be. For the people who have decided they're ready, they just love being able to get "blow your socks off" sound any time the spirit moves them. For people who are still deciding, I would just say, "let's get started and record some great music." There's no reason to wait or buy unnecessary equipment. Get those songs recorded right away.